If your job requires wearing a high pressure air cylinder in close proximity to open flames, the U.S. Department of Transportation wants to help you. No, that does not mean the DOT is going to show up with an extra hand line or a tanker full of foam. That is a little too specific for most bureaucrats. Like any government agency, the DOT is better at inventing one-size-fits-all solutions to slay dragons that do not even exist. In this case, the imaginary dragon being stalked is the danger connected with high pressure cylinders. Such cylinders have a wide variety of industrial uses aside from self-contained breathing apparatus for firefighters. And, industry-wide, we are unaware of any great rash of cylinder-related catastrophes that would merit DOT intervention. However, under a rule change proposed by DOT, the applied standards covering all high pressure cylinders will be radically altered. Firefighters generally prefer SCBA cylinders made from lighter composite materials. Be aware that under the new DOT rule a composite cylinder exposed to 350 degrees F or greater must be automatically condemned. That does not mean somebody is going to hurl obscenities at it. That means trashed, discarded and thrown away. No fire worth donning an airpack to battle would generate less than 350 degrees heat. Forget about a minimum exposure time. One second of exposure treated the same as a full hour. The only problem this rule change solves is that refilling used cylinders will no longer be necessary. Simply chunk 'em in the dumpster and be done with it. For years, SCBA airpacks have been subject to hydrostatic testing at regular intervals determined by the type of cylinder in use. Furthermore, the valve must be pulled and the inside thoroughly inspected. Under the proposed rule change, hydrostatic testing would be abandoned in favor of ultrasonic. The fact that ultrasonic is much more expensive and not effective in detecting flaws in cylinders with flat bottoms or hemispherical ends has not deterred the DOT. Yet, despite the insistance on ultrasonic, the new standard could hardly be called more stringent. Only a 90 percent sampling of cylinders would be subject to the new testing. Internal inspections will no longer be required, even if experience teaches that most SCBA corrosion problems begin inside. Under the new rule, high pressure cylinders must be labeled with its test pressure. Not working pressure, but the extreme limit of over-pressurizing the cylinder. Think back to the era when the NFPA required that fire hose be stenciled with its test pressure. The practice was abandoned because too many firefighters ended up pleading that, darn it, that lousy hose ruptured a long time before reaching full pressure. "It says 600 psi right there on the hose, Chief!" Absentmindedly bursting a fire hose is one thing. Accidently pressurizing an airpack cylinder to its extreme limit can prove fatal. Instead of relying on spring-loaded relief valves, most airpack cylinders are equipped with burst disks. These prevent the cylinder from violently rupturing while strapped to a firefighter's back. Situations where these disks are activated are rare, but it is still an important safety device. The DOT's one-size-fits-all rule change would require that the pressure needed to trigger the burst disk be increased. The idea is to reduce the chance of accidental release of proven (or unproven) toxins into the environment. Granted, high pressure cylinders are used to store hazardous materials. But, in the context of SCBA, increasing the disk activation pressure makes as much sense as selling toothpaste in spray bottles. It negates an important safety feature and clearly puts the firefighter at increased risk. Unlike the recent controversy involving aluminized fire gear, firefighters still have time to get ahead of the curve on this issue. The comment period on this new rule was originally to end in May. It has since been extended until Sept. 30, 1999. To voice your opinion on this issue, call Cheryl Freeman with the DOT at (202) 366-8553 or (202) 366-4545. 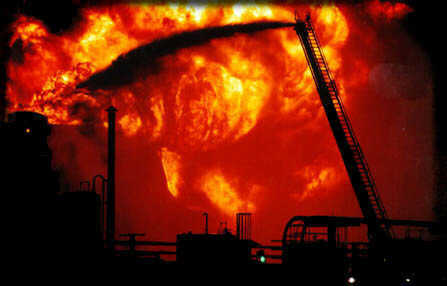 Industrial Fire World has already widely circulated this information via fax and e-mail. The response has been overwhelmingly negative regarding the new rule. As a wise man once said, the greatest lie ever told is any statement that includes the words "I'm from the government. I'm here to help." In this case, it is obvious that too little thought went into whether a problem truly exists and the best way to deal with it if it does.